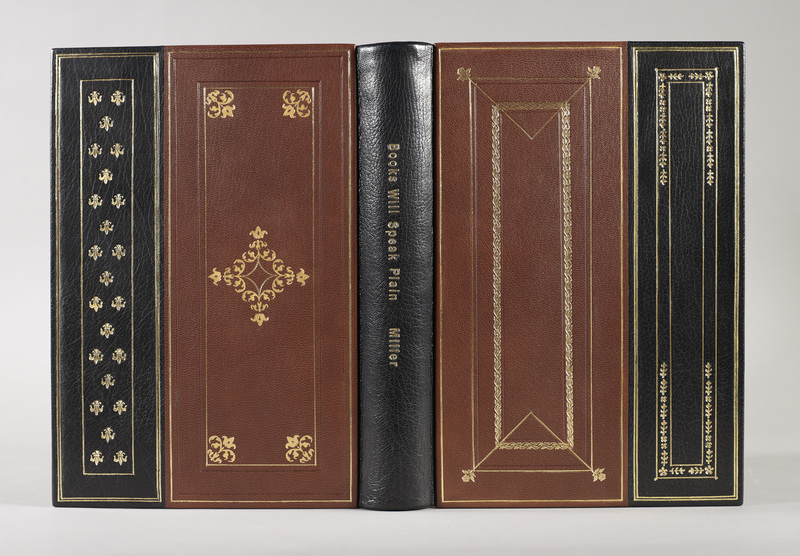 Bradel binding with black goatskin spine and fore-edges, boards covered in brown goatskin, handsewn silk endbands and marbled endpapers with leather hinge, gold and blind tooling represent historical tooling patterns: Aldine 15-16th c., semis 15th c., frame work 17th c., and Roger Payne 18th c.
Jana Pullman is a bookbinder, book conservator, and book arts instructor. She is the owner and operator of Western Slope Bindery, a fine press and book conservation business based in Minneapolis, Minnesota. She teaches workshops around the country. Jana, this is absolutely beautiful!